Living in a 20′ trailer throughout an Oregon winter cannot be all that much fun. But, Jim and Shirley Reuscher feel that, although it’s been a long haul, it’s been worth it. The Reuschers moved into the trailer in December, 1993, in order to be closer to the project that they began in October–the restoration of the former Schaffer house located just south of Gillespie Corners. The house stood vacant for 16 years before they purchased it, the barn, and 68 acres of land in August, 1993. According to Shirley, “The only tenants have been pack rats, flies, barn swallows, and ‘bats in the belfry’ in the time since 1978. Despite this, the house was in remarkably good condition.” The house, built by Doak (David?) Zumwalt in 1850, has been given historical status by Lane County. It is considered to be one of the best examples of Type II architecture in the county. It’s of English design featuring two identical front and back doors with a central fireplace and bedrooms at opposite ends of the house . According to Shirley, “a remarkable feature of the property is that the original barn, built in 1898, still stands. 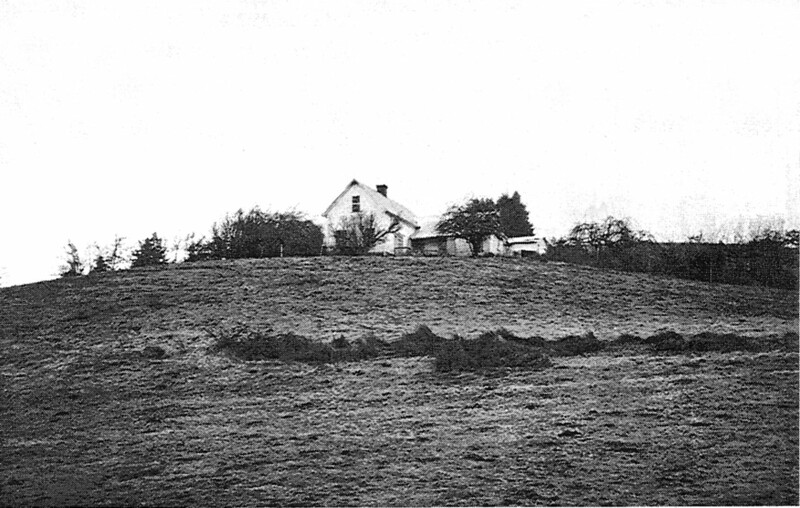 There are only a few existing historic home/barn combinations or operating farms left in Lane County.” The property is referred to by local residents as the “Schaffer place”, but historical records refer to it as the David Zumwalt house (see “Making a Plea for the Past”). The farm was purchased by Charles and Rose Schaffer in the 1920’s from the Stroup family and added to the Schaffer land holdings. The Schaffer’s 1,700 acres of land was divided among family members after Charles’ death in 1950. Sons, Charles (“Spike”) and Harvey Schaffer logged their share, the present Reuscher property, and later sold off the part of it that eventually became the Easy Acres development. The house was called home by a succession of renters until 1978, when it was abandoned because of deteriorating conditions that made it unsafe and uninhabitable. The process of restoring a home with historical status requires considerable work and much enthusiasm. 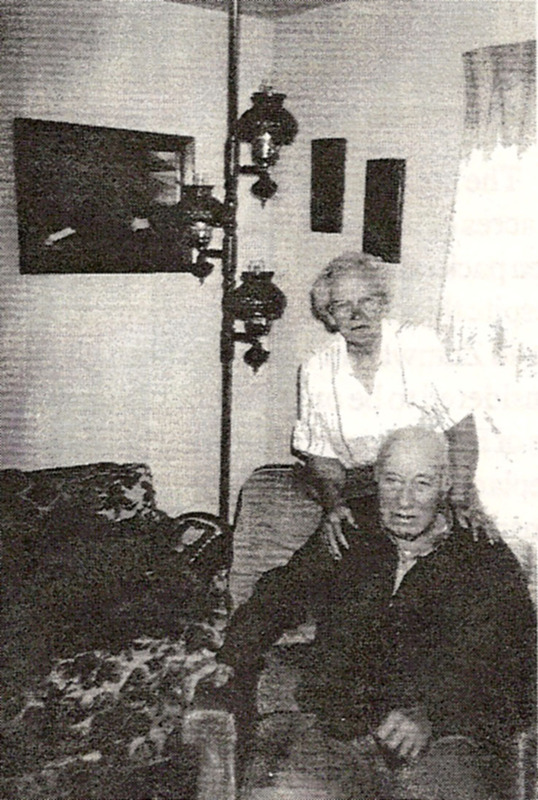 Jim and Shirley, who formerly lived on Briggs Hill Road before moving onto the property, have done much of the work themselves. Lane County’s requirements for the restoration of a historical home puts certain restrictions on what may be done to the dwelling under its preservation policy. These restrictions include a minimum of disturbance to the outside of the house; maintaining architectural integrity; no additions; and keeping the materials used as close to the original as possible. When they first began working on the house, there were blackberry vines growing inside the house, and trees, three inches in diameter, were growing horizontally from underit. Jim admits that one of the hardest tasks he’s faced in the restoration was removing the floors in the house and literally digging up all of the blackberry roots growing beneath it. The foundation had to be replaced, and the house had to be completely rewired. After the jungle of vegetation was brought under control around the house, a new front porch and back deck were built on, replacing those that had long ago deteriorated. The county allowed them to build a covered walkway between the house and garage, extending the kitchen area. It is expected that the Reuschers will be able to move into their home by late May. They have had many visitors inquiring about the progress and the history of the home since beginning the restoration project, and they plan to host an open house later in the year “after mud season” for those who wish to visit the property. 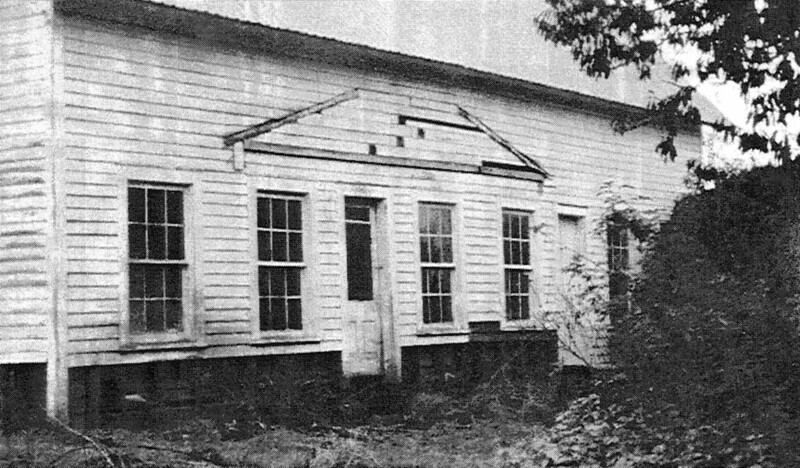 In a letter written on September 16, 1992, by Prof. Philip Dole, Professor of Architecture Emeritus at the University of Oregon, to Ken Howe, Associate Planner for the Lane County Planning Department, Prof. Dole expressed his concerns for the future of the historic David Zumwalt home, knowing that the property was in the process of being sold. Prof. Dole was concerned that “the new owners may ask for permission to demolish the house and replace it by a new home. Such an action is foreseeable because of rural residential zoning restrictions and the building’s condition, and perhaps because of ignorance of the building’s unusual history and actual and potential merits. ”The house is part of a very early historic farm group with both house and barn, a spring and old plants and orchard. Beautifully sited, prominently located, the Zumwalt farm group is a major visible feature for public using the Territorial Road. The adjacent county road alignment was variously known in the 1850’s as the Territorial Road, the Oregon and California Trail, the Old Trail, the Stage Road. This is the only remaining house which was part of this historic road’s setting in the late 1850’s. “The farm is connected with the 1850’s Overland Migration on the Oregon Trail through members of the David Zumwalt family covered wagon trip in 1852 from Pike Co., Illinois. Solomon Zumwalt was a leader in the Methodist Episcopal Church in the locality. The 1859 bridge built at Gillespie Corners to cross the Coyote Creek was the (Lane) County’s first. “This long, one and a half story house, begun around 1854, standing by 1859, belongs to that set of earliest wood structures in the County and in Oregon, of which few remain. (Rear kitchen ell is an addition of ca 1875.) 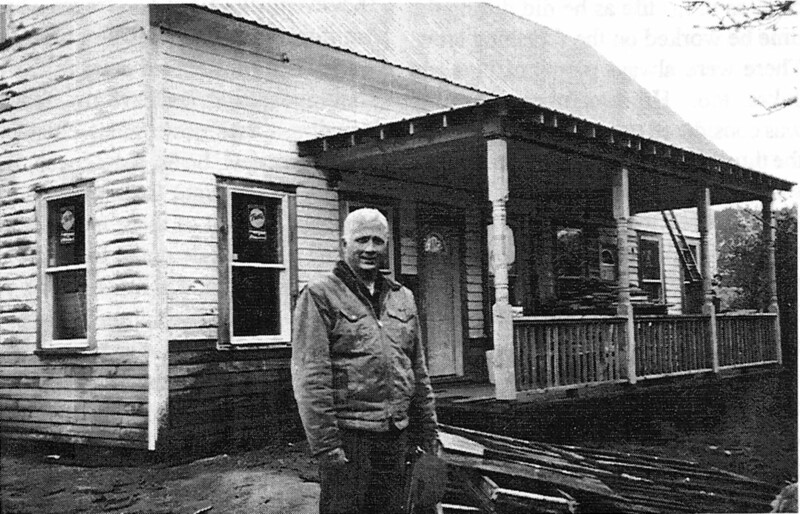 After log homes, the first lumber houses in Lane County were built in the 1850’s but of the hundreds built, only a dozen remain, most now in urban areas. Of Lane County’s few 1850’s houses remaining in an agricultural setting, the Zumwalt house is one of two still within an active farm. “The building shape, symmetry and detail (doors, windows, mantle piece) of the David Zumwalt house express the Classical Revival style, fashionable in Oregon from the 1840’s to the 1860’s. In contrast, the dining room-kitchen ell (wainscot, doors, chimney, windows, etc.) represent the Gothic Revival Style of ca 1870-1880. “A very important cultural feature is the plan with two separate, identically placed front doors into identical rooms. This plan, with the enclosed, winding staircase beside the central chimney can be traced back to East Coast colonial houses and across to sixteenth century farmhouses in Suffolk, England. This house type was found in many Southern States and, as such, carried by the Zumwalts to the Oregon Territory, a wonderful cultural phenomenon. “Material and assembly in the main (1854) building represents hand work methods perfected over hundreds of years, useful to the conditions of pioneer settlement into the 1860’s in the Oregon Territory. Wood probably came from the farm. In contrast, the ca 1875 Zumwalt dining-kitchen ell represents the earliest phase in Oregon construction of the change over to ‘modern’ machine-produced materials and parts. “A remarkable technological characteristic is the hand-hewn mortised and pegged wooden frame. Members include subfloor 8″x 10″ sills and cross girders, corner posts, 5″x 7″ intermediate posts, second floor girders, 6″x 7 1/2″ wall plates. Between hewn posts are walls of rough-sawn studs of two by five inches. This very early surviving example of balloon frame, and found in combination with a hewn frame, is nothing less than remarkable. “Rough boards from a simply equipped sawmill (a muley saw?) probably at the site were recut and hand planed for all ca 1854 boards on the doors, the exterior and interior walls, ceilings, the inch-and-a-half partitions, mantel piece moldings, window sash, and most of the interior flooring. “The entire front chimney is original and characteristic of the 1850’s, from the stack on the roof to the two fireplaces and the brick base beneath the house (except for some modern patching). The handmade bricks and the “mud” mortar, almost pure clay, perhaps came from nearby Coyote Creek. In summary, Prof. Dole continued, “The quality of structure and materials of the 1850’s work was excellent, carefully and substantially designed, assembled, and finished. “As architecture of the 1850’s (and 1870’s ell) this building is unusually intact. Minor interior wall changes have hardly affected the historic characteristics of the spaces. Some hardware and a mantel are missing. “To make this home suited to late twentieth century living, technical improvements and some spatial changes could be made and with minimum effect on the historic features and the significance of this remarkable house. “I wish that the further parts of this Lane County code (16.233 Historic Structures) contained at least one paragraph that was definitely encouraging to the owners of historic properties. And more helpful about the kinds of alterations which (can be made to a) historic building to accommodate modern amenities. The code as it stands presents the owner with disincentives rather than helpful guidance. If the purpose of the code is to ensure that historic buildings are preserved, the code should strongly promote their continued use. And so should each step of each application review. I wish to thank Marna and Bob Hing for their willingness to contribute information and their interview with Lincoln and May Diess to The Lorane Historian. I am hoping that others will be inspired to do the same. You don’t have to be considered a “good writer” to do interviews and submit material. All it takes is a willingness to interview your friends and neighbors who are probably even more interesting than you realize. If you get an article started for me, I’ll follow up on the information that I think needs to be added. The interview that Marna and Bob gave me was beautifully done and I had to do very little to complete it. The words are almost exclusively theirs. It is this “flavor” that I would like to add to The Historian. Jim and I and the Edwards family would like to thank all of you who sent cards, food, and expressions of condolences following the death of Jim’s mother, Mae Rose, on May 1. It was a rough week for a close family. Mom was the matriarch of the Edwards family and the remaining parent. The grief we felt, however, was for ourselves because, at almost 83 years of age, Mom “did it right.” She never had to spend a day in a hospital except for the births of some of her 8 children. It helped to know how many of you were thinking of us in our grief. Thank you so very much from each of us.